The 2-D Studies are smaller carvings where I improvise and experiment with new concepts. Think of these as coming from a Woodworker’s Forge For Ideas. 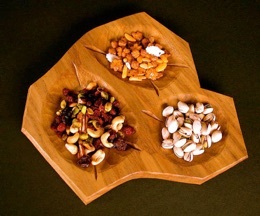 Like the larger work, these pieces are fully functional, intended for real use when serving small “starters” such as nuts or olives, or whatever else you may think of. The 2-D Studies represent an opportunity for users and art collectors to own an original work at a price significantly lower than the larger pieces. They also make great gifts. Of course, each piece is a unique creation. The first 2-D Studies were carved in early 2008 as gifts that I will be taking to Japan during the Country Workshops Craft Tour in October. After finishing about 12, I realized that these small pieces were a special format that should be continued and made available. The 2-D Studies are about 1 inch in height and can have one to several hollows. Width and length ranges from about 3 x 5 inches to about 10 x 14 inches. The wood used in the 2008 2-D Studies is air-dried sassafras. 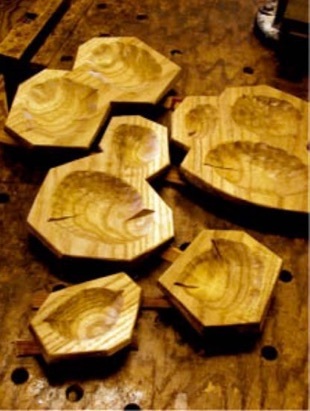 These pieces are 100% hand-carved and detailed, using gouges and paring chisels. The finish is cold pressed flaxseed oil thinned with citrus peel solvent. Unlike the larger work, the top and bottom surfaces are machine planed and then lightly hand sanded. All 2-D studies are signed with “DL” initials and a 2-digit year, by engraving or kolrossing. These pieces are not numbered, and purchase does not include a Certificate of Provenance or a photo CD.